Ernie’s Cycle Shop was established in 1952 by Ernie & Myrtle Wiedmann. It has been a family owned and run business, with the owner in the shop, from the beginning to now. Ernie and Myrtle sold it to their son (Chuck) and niece (Jane Sinclair) in the 1980’s and then they sold it to the current owners, Bruce and Sylvia Wallingford in 2003. 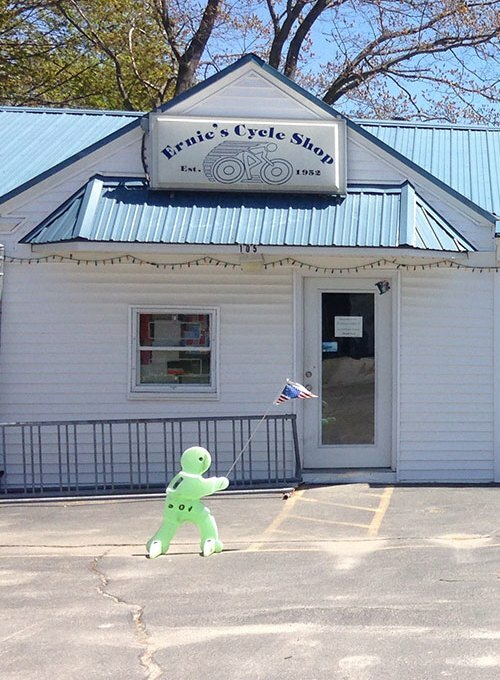 With great pride, the name “Ernie’s Cycle Shop” has stuck. For more than 65 years Ernie’s Cycle Shop has kept their customers rolling with a smile. Offering excellent products at reasonable prices, delivered by friendly, knowledgeable staff whom all have a passion to ride. Combined with a “Grade A” service shop and trained technicians, it’s no wonder we’ve been around for a while. The Bicycle Coalition of Maine researched the facts and informed us that we are “The Oldest Bicycle Shop in Maine, and one of the oldest in New England. It all began with a handshake between a hardware store owner and Ernie, The hardware store owner didn’t want to keep working on bikes on an already busy Saturday. He had to do something, so he sold that part of his business to Ernie. It’s with that “handshake” integrity that this shop has been operated with over the years that our loyal customers have grown to trust and rely on. “Slightly off the beaten path, but are well worth finding”, says one of our customers. This fact, that we’re just off Route 25, is a mixed blessing. Once you know we are here, it’s easy to get to. However, when your not easy to see from the main drag, you can be missed altogether. That is a danger we are willing to live with as the reward for not being on the main drag is immense. Literally anyone can feel at ease and safe test riding a bike on our entire street. We also have a Portland Trails trail immediately beside us, which goes all the way to the river. So you might say test rides are mostly worry free. “Life’s a cycle, we hope you’re enjoying the ride!” That is our mission! help you to “enjoy the ride”. To do that, we must offer top notch customer service to get you on the right bike for your needs. Deliver the information you need to help guide you to “the ride of your life”. We want you to LOVE riding is much as we do. We are sincerely vested in this mission.